06: PhotoShield Cover: Buy 2 Get 1 Can of PhotoBlocker + FREE Shipping (50-70% OFF!) Discounts Apply ! Our PhotoShield is a high quality clear cover. 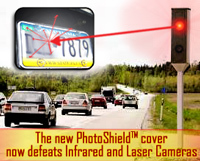 Incorporating a thin diffusion lens, designed to defeat both photo radar and the red light overhead cameras! Our design is effective, inconspicuous and defeats most cameras! IMPROVED lens design works to absorb and diffuse incoming laser beams from laser guns, helping to prevent an accurate reading. Note: Buyer assumes all responsibility for using this cover in compliance with local motor vehicle codes in their area of vehicle use.